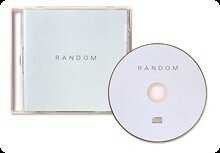 "Only a Japanese designer would think to make a cd with only sound; that randomly makes songs by itself! Pop this cd in and hit the "random play" button. The cd will make up music and songs as it plays. 99 tracks of random scales. The cd will automatically select random tones, making new melodies. If you like a song the cd has composed, simply hit random and return functions simultaneously and the tune will play endlessly. Unexpected and quirky and very Japanese! **Please make sure your cd player has a random function. The cd will not play otherwise." Wow. Somebody beat Brian Eno to the punch. Nice one.